Cut the cord. 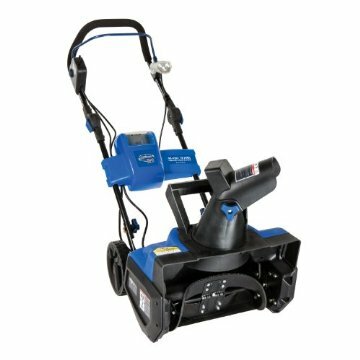 Ideal for clearing snow from sidewalks, driveways and decks, the Snow Joe iON is the newest addition to the Snow Joe lineup and the first single stage snow blower to provide easy and convenient CORD-FREE operation. Powered by EcoSharp technology, Snow Joe’s patent-pending rechargeable 40-volt lithium-ion battery system, the iON delivers up to 40 minutes of whisper-quiet run time with zero carbon emissions for cleaner air. No pull-cords, gas, oil, tune-ups or tangled extension cords to cause unnecessary frustration! The iON starts instantly with a simple push of a button and its adjustable handle maximizes user comfort during use. Equipped with a heavy-duty, 2-blade rubber auger, the iON cuts through thick and heavy snow, clearing a path 18-inches wide and 8-inches deep with each pass. Plus, the rubber scraper bar at the base of the unit lets you clear right to the ground without damaging your deck or pavement. Featuring a 180 degrees auto-rotate chute that rotates instantly with the push of a switch, the iON lets you throw snow up to 20 feet in the direction you want it to go. For nighttime snow removal, the iON has an integrated LED headlight that easily switches on to increase visibility. GET EQUIPPED this winter with the Snow Joe iON – the easy, convenient and cordless solution to get snow out of your way on your snow day. Store: bungaemuri Condition: New (Open Box, or other) Price: $179.96 Total Price: $179.96 Buy It from bungaemuri No returns.